These CellAd Ad Serving Terms and Conditions (“Agreement”) between You and Cell Ad Technologies Ltd. (“CellAd”) constitute the terms and conditions for your use of the CellAd Ad Serving program (the “Platform”). “You” or “Your” means any entity identified in an enrollment form submitted by the same or affiliated persons, and/or any agency, network or other third party that You have granted access to Your account, all of whom will be bound by this Agreement. 1. Description of Platform. 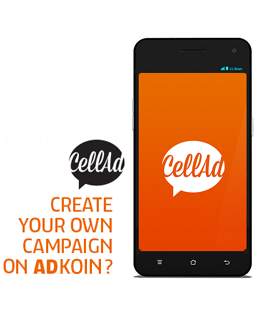 The Ad Serving Platform allows You to serve Your or third party advertisements that You make available to CellAd (Your “Ads”) for display on the applications and sites that You designate (“Platform Sites”), based upon the criteria selected by You or Your advertisers via the CellAd online user interface provided by CellAd for accessing the Platform (“Platform Interface”). 2. Fees. There are free (with limited functionality) and paid (with full functionality) versions of the Platform. (a) Free Version. CellAd provides access to the Platform free of charge, subject to approval. CellAd reserves the right to revoke access and charge fees for the free version of the Platform and related training. If CellAd elects to charge fees for access, CellAd will give you 14 days advance notice, during which period You will have the right to terminate your participation in Platform. (b) Prepaid Version. If You are accepted as a Prepaid member of the Platform, you are subject to fees based on the ad display functionality that you select and visible at time of selection. CellAd service is a prepaid service. In the event that you have insufficient funds in your prepaid CellAd account or You fail to pay invoices by the due date this may, without notice, cause interruption to your service or a change in service level. Additional charges may be applied for service restoration. You are responsible for paying any and all withholding, sales, value added or other taxes, duties or charges applicable, other than taxes based on CellAd’s income. 3. Implementation of Platform. You will implement the Platform in a manner that complies with the technical and implementation requirements provided by CellAd from time to time. (a) Ads and Content. You are solely responsible for all of Your Ads and related urls, phone numbers, content and subject matter, editorial, text, graphic, audiovisual, and other content and any other information You make available for the Platform, whether generated by or for You (Your “Content”). (b) Your Account. You will protect any Platform accounts, usernames or passwords and take full responsibility for Your own, and third party, use of the same. (e) Prohibited Actions. You will not, and will not allow any third party to: (a) directly or indirectly access, launch or activate the Platform through or from, or otherwise incorporate the Platform in, any software application, website or other means other than Your designated sites; (b) transfer, sell, lease, syndicate, sublicense or lend the Platform; (c) directly or indirectly generate queries, or impressions of or clicks on ads, through any automated, deceptive, fraudulent or other invalid means (including, but not limited to, click spam, robots, macro programs, and Internet agents); (d) encourage or require end users or any other persons, either with or without their knowledge, to click on ads, including without limitation Ads, through offering incentives or any other methods that are manipulative, deceptive, malicious or fraudulent; (e) modify, adapt, translate, prepare derivative works from, decompile, reverse engineer, disassemble or otherwise attempt to derive source code from the Platform, CellAd’s then current Protocol, or any other CellAd technology, content, data, routines, algorithms, methods, ideas design, user interface techniques, software, materials, and documentation; (f) remove, deface, obscure, or alter CellAd’s proprietary rights notices affixed to or provided as a part of the Platform, the CellAd Protocol, or any other CellAd technology, software, materials and documentation; (g) create or attempt to create a substitute or similar service or product through use of or access to any of the Platform or proprietary information related thereto; (h) use any feature or functionality of the Platform, or include anything in Your Content or Ads, that could be used to personally identify or personally track individual end users or any other persons; or (i) engage in any action or practice that reflects poorly on CellAd or otherwise disparages or devalues CellAd’s reputation or goodwill. CellAd may terminate the Platform, immediately upon written notice if You breach this Section. (f) No Endorsement. You acknowledge and agree that CellAd is not affiliated with or responsible for any third-party products/services You may choose to manage with the Platform. CellAd reserves the right, but will have no responsibility, to edit, modify, refuse to post or remove any Disclaimed Content, in whole or in part, that in CellAd, in its sole and absolute discretion, deems is objectionable, erroneous, illegal, fraudulent or otherwise in violation of this Agreement. (g) Compliance. CellAd may investigate any activity that may violate this Agreement. If You violate this Agreement or any Policies, CellAd may in its sole discretion, without notice, terminate this Agreement, or suspend or terminate the participation of Your Platform Site in all or part of the Platform. For any other violations, CellAd will give you 14 days notice period to cure such violations, and if such violation is not cured within 14 days of CellAd sending such notice to You, CellAd may terminate this Agreement, or suspend or terminate the participation of Your Platform Site in all or part of the Platform. In addition, CellAd may terminate this Agreement, or suspend or terminate the participation of Your Platform Site in all or part of the Platform, with or without cause, upon 90 day’s prior notice. CellAd may refuse to process a request for Your Ads (“Requests”) that are not sent in compliance with the requirements of this Agreement. (h) Advertisers. You are solely responsible for all matters related to Your third party advertisers who provide advertisements to You in connection with the Platform (Your “Advertisers”), including without limitation the solicitation and trafficking of Your Ads, billing and payment of Your Advertisers, providing all technical support services to Your Advertisers, and handling all other inquiries and disputes of any type or nature. (a) Subject to the terms and conditions of this Agreement, You shall have the right during the Term to access and use the Platform via the Platform Interface solely for purposes of: (a) performing projections of advertising impression inventories that might be available through the CellAd Platform, (b) uploading and storing Ads for delivery through the CellAd Platform, (c) selecting targeting and delivery criteria for the delivery of Ads, and (d) receiving reports of Ads Requests, impressions and other data related to the delivery of Ads through the CellAd Platform. (b) During the Term, You grant CellAd a license under all of Your applicable rights to host, serve, route and place Your Ads via the Platform. (c) CellAd Attribution. You agree that CellAd may include CellAd Brand Features or other attribution on Your Ads transmitted by CellAd in response to a Platform Request. 6. Term. This Agreement will be effective as of the date CellAd activates Your Platform account and will continue unless earlier terminated as provided in this Agreement. You may terminate this Agreement, with or without cause, at any time by sending written notice of Your desire to cancel Your participation in the Platform to info at cellad.com (the “Term”). This Agreement will be deemed terminated ten business days after CellAd’s receipt of Your notice. If CellAd chooses to terminate the Platform, CellAd will provide You with 30 day’s prior notice thereof. (a) Data. In connection with the operation of the Platform, CellAd collects and receives data that CellAd collects during delivery of Ads or performance of our obligations under this Agreement (“Data”). You agree that CellAd may: (a) use such information for CellAd’s internal business purposes; (b) disclose such information as may be required by law or legal process; and (c) use and disclose such information when it is aggregated with similar information relating to other CellAd customers or end users, and when it does not specifically identify the Customer or end user. You may use Data that You receive for Your internal business purposes so long as such use is in compliance with all applicable privacy policies, laws, rules, regulations and industry self-regulatory regimes relating to the collection, use and disclosure of Data, and that You obtain any consents, authorizations and clearances from end users that may be required in connection therewith. 8. Confidentiality; Publicity. You agree not to disclose CellAd Confidential Information without CellAd’s prior written consent. “CellAd Confidential Information” includes without limitation: (a) all CellAd software, technology, programming, specifications, materials, guidelines, pricing and documentation relating to the Platform, including the existence and content of this Agreement and any information provided pursuant to the Agreement; (b) any statistics relating to the performance of the Platform; and (c) any other information designated in writing by CellAd as “Confidential” or an equivalent designation. CellAd Confidential Information does not include information that has become publicly known through no breach by You or CellAd, or information that has been (i) independently developed without access to CellAd Confidential Information as evidenced in writing; (ii) rightfully received by You from a third party; or (iii) required to be disclosed by law or by a governmental authority. You will not use CellAd’s Brand Features in any news release, public announcement, advertisement, or other form of publicity in relation to this Agreement without securing the prior written consent of CellAd. 9. Disclaimer. You acknowledge that the Platform is still experimental in nature. CellAd does not represent or warrant that the Platform is reliable, accurate, complete, or otherwise free from defects. Accordingly, the Platform is made available for use “as is”, and any use thereof will be undertaken solely at Your own risk. CellAd reserves the right, in its sole discretion, to include or cease providing the Platform at any time (subject to notice as may be required herein), and CellAd does not give or enter into any conditions, warranties or other terms with regard to the Platform. In particular, no condition, warranty or other term is given or entered into to the effect that the Platform will be of satisfactory quality, non-infringement or that the Platform will be fit for any particular purpose. For the avoidance of doubt, CellAd does not guarantee the Platform will be operable at all times or during any down time (i) caused by outages to any public Internet backbones, networks or servers, (ii) caused by any failures of Your equipment, systems or local access services, (iii) for previously scheduled maintenance or (iv) relating to events beyond CellAd’s (or its wholly owned subsidiaries’) control such as strikes, riots, insurrection, fires, floods, explosions, war, governmental action, labor conditions, earthquakes, natural disasters, or interruptions in Internet services to an area where CellAd (or its wholly owned subsidiaries) or Your servers are located or co-located. 10. Limitation of Liability. CELLAD AND ITS WHOLLY OWNED SUBSIDIARIES WILL NOT BE LIABLE TO YOU OR ANY THIRD-PARTY CLAIMANT FOR ANY INDIRECT, SPECIAL, PUNITIVE, CONSEQUENTIAL (INCLUDING, WITHOUT LIMITATION, LOST PROFITS OR LOST DATA COLLECTED THROUGH THE PROGRAM), OR INCIDENTAL DAMAGES, WHETHER BASED ON A CLAIM OR ACTION OF CONTRACT, WARRANTY, NEGLIGENCE, STRICT LIABILITY, OR OTHER TORT, BREACH OF ANY STATUTORY DUTY, INDEMNITY OR CONTRIBUTION, OR OTHERWISE, EVEN IF CELLAD AND/OR ITS SUBSIDIARIES AND AFFILIATES HAS BEEN ADVISED OF THE POSSIBILITY OF SUCH DAMAGES. SOME STATES DO NOT ALLOW THE LIMITATION OR EXCLUSION OF LIABILITY FOR INCIDENTAL OR CONSEQUENTIAL DAMAGES, SO THE LIMITATIONS OR EXCLUSIONS IN THIS AND THE FOREGOING PARAGRAPH MAY NOT APPLY TO YOU. In any event, CellAd’s (and its wholly owned subsidiaries’) total cumulative liability to You or any other party for any loss or damages resulting from any claims, demands, or actions arising out of or relating to this Agreement will not exceed U.S. $500. 11. Representations and Warranties. You represent and warrant that: (a) You have and will maintain throughout the Platform Term all rights, authorizations and licenses (including without limitation any copyright, trademark, patent, publicity or other rights) that are required with respect to Your Ads or Content to permit CellAd to perform the Services contemplated under this Agreement (including without limitation any rights needed to host, cache, route, transmit, store, copy, modify, distribute, perform, display, reformat, excerpt, analyze, and create algorithms from and derivative works of Your Ads or Content); (b) You will not advertise anything illegal or engage in any illegal or fraudulent business practice; (c) all of the information provided by You to CellAd to enroll in the Platform is correct and current at all times; (d) You have all necessary right, power, and authority to enter into this Agreement and to perform the acts required of You hereunder; and (e) You have complied and will continue to comply with all applicable laws, statutes, ordinances, and regulations (including without limitation the CAN-SPAM Act of 2003 and any relevant data protection or privacy laws) in Your performance of any acts hereunder; (f) You comply with and have any and all consents, authorizations and clearances from end users of the Platform Sites to allow CellAd to collect and use the Data in accordance with Section 7(a), and as may be required for CellAd to provide services hereunder; and (g) You will at all times comply with CellAd Policies. 12. Indemnify. You agree to indemnify, defend and hold CellAd, its agents, affiliates, subsidiaries, directors, officers, employees, and applicable third parties (e.g. relevant advertisers, syndication partners, licensors, licensees, consultants and contractors) (collectively “Indemnified Persons”) harmless from and against any and all third party claims, liability, loss, and expense (including damage awards, settlement amounts, and reasonable legal fees), brought against any Indemnified Person(s), arising out of, related to or which may arise from Your use of the Platform, the Platform Sites, and/or Your breach of any term of this Agreement. 13. Miscellaneous. All claims arising out of or relating to this Agreement will be litigated exclusively in the COURTS OF Dublin, Ireland and CellAd and You consent to personal jurisdiction in those courts. The Agreement constitutes the entire agreement between the parties with respect to the Platform. Any notices to CellAd must be sent to: CellAd Ltd. with a copy to Legal Department, via first class or air mail or overnight courier, and are deemed given upon receipt. Notice to You may be effected by sending email to the email address specified in Your account, or by posting a message to Your account interface, and is deemed received when sent (for email) or no more than 15 days after having been posted (for messages in Your Platform Interface). CellAd’s waiver of any default is not a waiver of any subsequent default. Unenforceable provisions will be modified to reflect the parties’ intention, and remaining provisions of the Agreement will remain in full effect. You may not assign any of Your rights hereunder and any such attempt is void. CellAd and You are not legal partners or agents, but are independent contractors. Sections 2, 4, 7, 8, 9, 10, 11, 12 and 13 will survive any expiration or termination of this Agreement.